Vince Staples Reps Fergie, Joy Division, And Howard The Duck On What’s In My Bag? 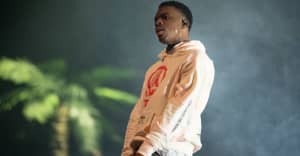 Vince Staples was the latest artist to get to wander the aisles of Amoeba Records for the record store's What's In My Bag? video series. Staples picked up an eclectic mix of pop culture gems including records by Joy Division, The Internet, and Led Zeppelin as well as Fergie's 2006 album The Dutchess. Explaining the reasons for picking the latter album, Staples replied, "Bangers. Top to bottom." He also took home Tha Dogg Pound documentary DPG Eulogy, a t-shirt of 1980s Scottish new-wave band Strawberry Switchblade, and a Howard The Duck toy "for the house." Check out Staples's basket above. Read the Vince Staples, Regular Genius cover story here.